The skunk is an omnivorous mammal that lives in North America and South America. 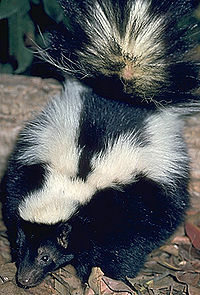 Some varieties of skunks also live in the Phillipines and in Indonesia. All skunks belong to the family Mephitidae. Skunks are small, usually only 15 inches long and 1 pound, and are black with a white stripe or stripes along their back. Skunks are striped from birth, unlike most animals which only get their defined markings later in life. Skunks are most commonly known for their ability to spray a rotten smelling fluid up to 10 feet, as a defense to ward off attackers. Skunks usually do not spray until after hissing and stamping their feet. Skunks are sometimes called polecats, because they resemble European polecats, although they are not classified as related. This page was last modified on 3 September 2009, at 13:17.